Not long ago, I was thinking to myself, self, we haven't drank any non-Islay Scotch in quite some time. Don't get me wrong, I love wondering who put their cigar out in my whisky, and peaty Islay Scotch does the trick quite nicely (and don't worry, we'll get back to Islay later this month). But I was in the mood to branch out a bit, and my attention was brought to Aberlour A'Bunadh. I'm reliably informed that this is pronounced "ah-boo-NARRRGGHHHHH", which is fun in and of itself, even if it's not at all true. Seriously, though, it translates to "the original" from Gaelic, and is thus an ode to Aberlour's founder. 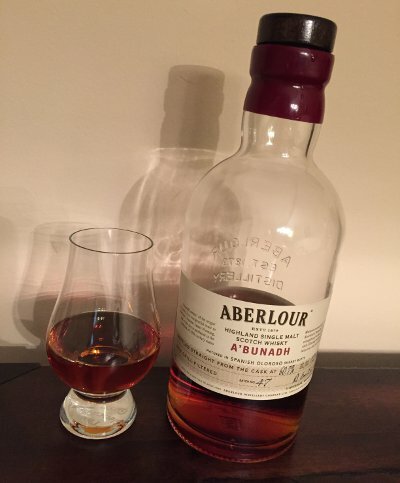 Aberlour A'Bunadh - Pours a warm orange color with a hint of red when you look at it in the right light, lots of ample legs. From the smell, the sherry influence is immediately apparent, but you also get a nice spicebox. Candied fruit, raisins, cinnamon, actually a little on the festive side. As you add water, the fruit lessens and the spicebox increases. I'm also getting a nice waft of something almost fudgelike, cacao nibs and the like, really quite nice. Taste is a little on the hot side, which I guess is to be expected from a cask strengther like this, but the spicebox comes through strong, with a nice fruity sherry influence too, those raisins and other dried and candied fruits, only hints of the fudge. Mouthfeel is thick and oily, and quite hot. Water helps smooth it out some, make it more approachable, but at the cost of intensity. Was definitely a bigger sherry bomb when I initially opened it, but it's still drinking quite nice. Overall, a very nice sherry finished scotch, one I'm really happy I tried. Indeed, it seems just about perfect for the likes of me, a mere dabbler in the world of whisky. Whisky Nerd Details: 121.4 proof (60.7% ABV) bottled (750 ml). Drank out of a glencairn glass on 12/9/15. Next up on the Scotch front, we've got some old Caol Ila that I'm hoping will be quite nice. In the meantime, we've got some Port wine on deck, and a couple bourbons later in the week. So if white wines are the lagers of wine, are red wines the ales of wine*? Alright, fine, I won't just write the inverse of Tuesday's post and will instead leave it as an exercise for the reader. Wine Nerd Details: 14.1% ABV bottled (750 ml corked and served slightly below room temp). Drank out of a wine glass on 2/20/16. Vintage: 2013. 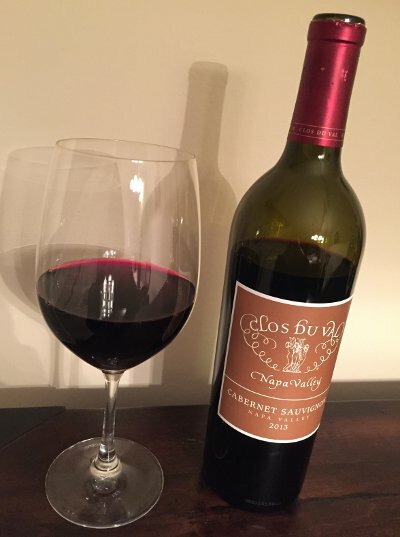 Food Pairing: It was unseasonably warm on Saturday, so I broke out the grill and made a nice Filet Mignon, and the pairing went quite beautifully. Sides were sauteed mushrooms and asparagus, both of which worked fine. I tried some dark chocolate, which worked well enough, but perhaps not as great as some beer/chocolate pairings I've had. Beer Nerd Musings: It should be unsurprising that Cabernet Sauvignon barrels are quite popular with breweries making American Wild Ales. The proximity between Californian breweries and wineries often leads to collaborations of a sort, even if some winery employees are afraid to go to breweries like Russian River for fear of picking up some Brettanomyces at the brewery and inadvertently introducing the wild yeast back at their winery (Brett, while great in beer, is apparently deeply reviled in wine, though I'd be really curious to see what a Brett wine would be like, just for yucks). Russian River's Cabernet Sauvignon barrel aged sour is called Consecration, and it enjoys a great deal of popularity, though it's actually my least favorite of Russian River's standard lineup (I suspect this has more to do with the high level of alcohol than the wine though). Other Cab aged beers that I've reviewed include Dock Street Flemish Red and Avery Tectum Et Elix. Some beers will even be aged on Cabernet Sauvignon grapes (like, say, Cascade's Sang Royal, a great beer). * Or, as Cian asked, are red wines the stouts of wine? That is a trickier proposition, but my guess is that most red wines are not very stoutlike except in more general terms of intensity or complexity or something like that. However, I did have that Carmenere last year that was distinctly stoutlike, so there is that. ** Don't say "cheese eating surrender monkey", don't say "cheese eating surrender monkey", don't say "cheese eating surrender monkey", don't say "cheese eating surrender monkey", don't say "cheese eating surrender monkey", ah crap I just said it 5 times. Is white wine the lager of wine? The problems with using a wisdom-of-the-crowds ranking of beer are myriad, but one thing that will almost certainly jump out at you is the distinct lack of lagers. I'm as guilty of this as anyone, but I have been trying to get my lager on in recent months (heck, I even included a lager in my top 40 of 2015!) There are lots of reasons for this perceived lack of enthusiasm and I could probably spend a few thousand more words on the subject (my own theory is along the lines of people associating lagers with Beast or Natty Light or whatever cheap garbage we drank in college), but I think we can all agree that lagers get short shrift from beer nerds. I see a similar dynamic with white wine. Keeping in mind that I'm on the outside looking in, there is a stereotype that wine nerds tend to prefer red wine, some going so far as to say they don't ever really drink white wine. I have two informal guides to the world of wine, and one of them is definitely like that. The other is not, but then, most of what I see him talk about is reds. I gather the reasons for this tend to be the same. Reds (or ales) are richer, more complex, more intense, and go better with red meat, while whites (lagers) are more subtle and nuanced. Again, this isn't necessarily true, but it's what I see looking in from the outside. Even the reversal revelations hold a similar pattern. I used to only drink reds until one day someone sprung a particularly great white on me and now I enjoy them too. I gather food pairing has a lot to do with this, moreso with wine than beer, but the point holds. My own lager revelation was after a week of particularly intense drinking in Vermont (so lots of face-melting IPAs). I was about to go to a beer festival later that night, so I didn't want to kill myself and picked a Czech Pilsener I had heard about. It was sublime, and ever since then, I've been giving lagers a chance. Mind you, my beer diet is still primarily ales, but the occasional lager is more diverse than no lagers. In terms of wine, I have also tended to gravitate towards reds. But the whole point of this semi-hiatus from beer that I'm currently mired in is to try new things that I might not otherwise seek out. 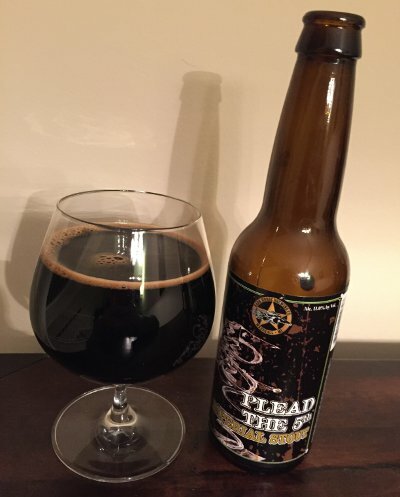 So I took a flier on this PLCB Chairman's Selection, in part because I really enjoyed last year's Stag's Leap Merlot. Funnily enough, I see that this is not actually the same winery. Stag's Leap Wine Cellars is different from Stags' Leap Winery. Both are located in what is now called the Stags Leap District. Truly, these people know how to strategically place (or not place) an apostrophe. 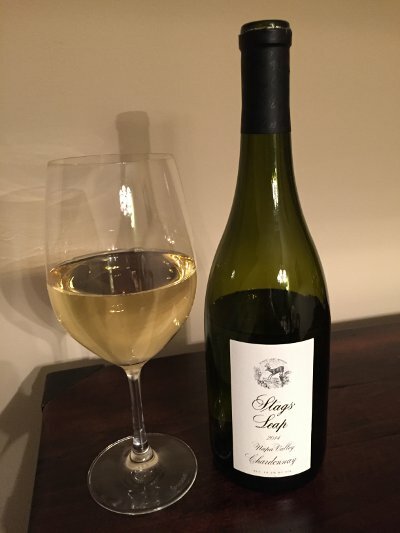 Stags' Leap Chardonnay - Pours a clear, very light yellow color. 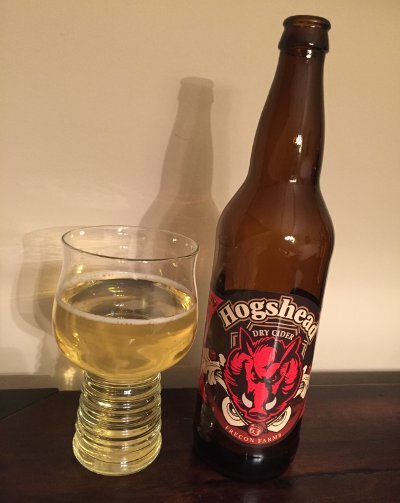 Smell has a nice stone fruit character going on, pears, maybe a little in the way of peach. Taste moves in a sweet direction, some oaky richness, some citrusy notes here too, maybe hints of lemon (but not really tart) in addition to the pear and peach from the nose. Mouthfeel is bigger bodied than I expected, some acidity, hints of alcohol warmth. Overall, this is a very nice Chardonnay, well balanced, sweet, tasty. Still not the revelation I was seeking, but I guess I'll give it a B? Wine Nerd Details: 14.2% ABV bottled (750 ml corked and chilled). Drank out of a wine glass on 2/19/16. Vintage: 2014. Food Pairing: I paired this with a pretty good grade plate of sashimi and nigiri sushi, and it worked well enough. Not a revelatory pairing, but I can picture the white wine pairing better with that dish than pretty much any red I've ever had (which might overpower some of the more delicate pieces of fish I had). Beer Nerd Musings: I pretty well summed up my beer nerd musings above, but I will note that while I enjoyed this white, it didn't ignite a passion for exploring more whites. I do, however, think a good pilsner could pair very well with sushi, even if it's something I haven't done often (or lately). Once this hiatus is over, I may have to grab a growler of Victory's Braumeister Pils and pair it with the same meal to see how well the pairing compares to this white wine. And that about covers the white wine portion of this current beer hiatus. Stay tuned for a red wine review later this week. Next week we'll probably hit Scotch, bourbon, and maybe a Port wine too. After that, who knows? Continuing my tour through the realms of unsexy staples brings me to the Old Grand-Dad line of bourbons (a subset of Beam Suntory's lineup). There are several expressions (most of which are packaged in industrial grade neon orange labels), but they all use the same high-rye recipe (30% rye compared to Beam's normal 15%), with the main difference being the proof. There's also Basil Hayden's, which uses the same recipe and is apparently named after the "Grand-Dad" in question (it used to be an 8 year old bourbon, but they dropped the age statement a while back). That one is also quite disappointing. 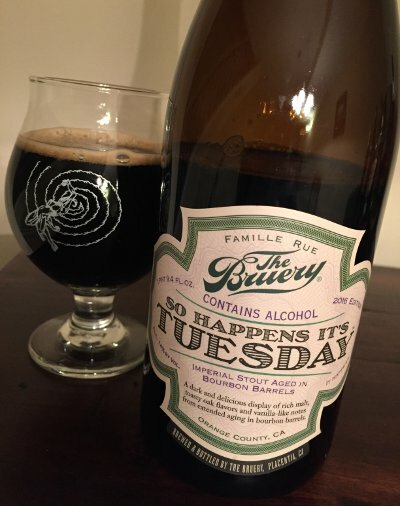 I've seen the fancy bottle with the moderately high price tag in the liquor store and considered it, but I'm glad I opted to get a pour at a bar one night, as it didn't make much of an impression. I later found out that it's bottled at 80 proof, which might explain the underwhelming reaction. Whiskey Nerd Details: 114 proof (57% ABV) bottled (750 ml). Drank out of a glencairn glass on 2/12/16. Bottle sez: Lot No. 1. 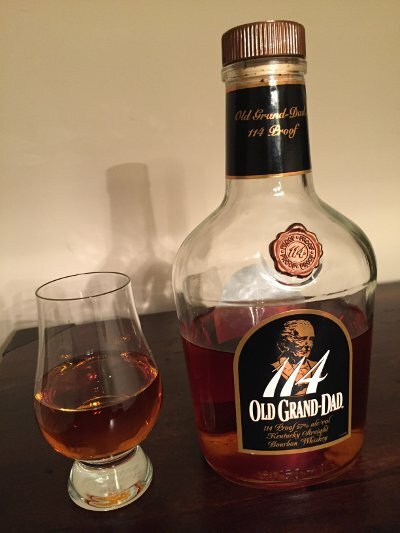 Beer Nerd Musings - There are plenty of beers aged in Jim Beam barrels (Allagash apparently favors those barrels), but ones that specifically call out Old Grand-Dad are few and far between. 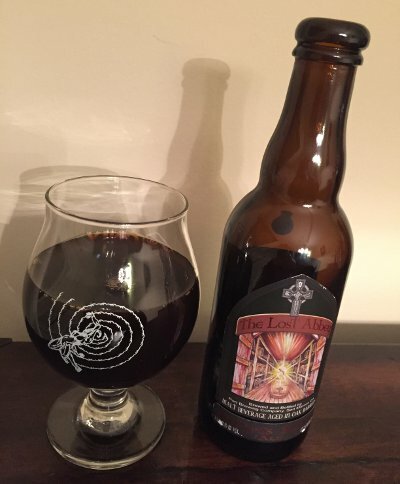 The only one I could really find was from Rock Bottom, ugh (I mean, I haven't had it so I shouldn't judge, but a 5.5% ABV stout aged in OGD barrels for 2 weeks doesn't inspire confidence). As per usual, I'm sure some of the bigger barrel aging programs use these barrels as part of a larger blend, not to mention the large amount of folks who don't specify which brand of barrels they used (perhaps the notion of OGD being a "budget" bourbon doesn't lend itself to such marketing efforts). I could see OGD working well though, so maybe someone should give it a shot (looking at you, Fifty Fifty - how have you not used any Beam products in your Eclipse series? Unless you count Maker's, I guess.). If I didn't already have my oak cubes soaking in Four Roses, I might have used this for my next BBA homebrew. It seems like it could work well. One of the many things I love about winter is that I generally take the opportunity to do some slow cooking. Soups are a staple, sometimes I'll slow cook ribs or pork shoulder, but this past weekend, I made some Italian tomato sauce. There are, of course, many ways to do so, but I went low and slow, ending up with something more on the chunky side. I also managed to procure some high end sausage, meatballs, and tortelinni, so all was well with the world. To pair with this magnificent feast, I obviously had to go with Italian wine, so I pulled out this bottle I bought a couple years ago. Wine Nerd Details: 13.5% ABV bottled (750 ml). Drank out of a wine glass on 2/13/16. Vintage: 2011. 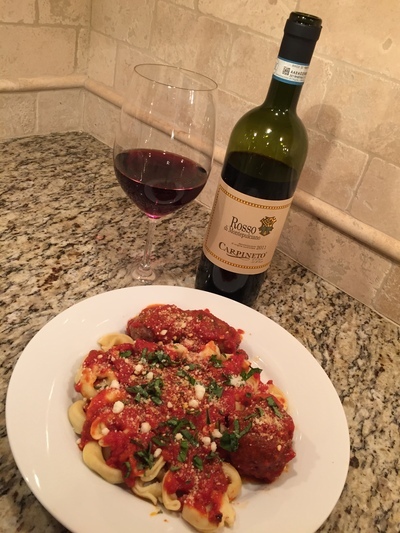 Food Pairing: As mentioned and pictured above, I made some tomato sauce (starting with San Marzano tomatoes, with onions, garlic, oregano, red pepper, and fresh basil, simmered for a few hours with Parmesan cheese rind for added flavor), served atop a decent grade Italian sausage, veal/beef/pork meatball, and tortellini. The wine went well with this meal. Not a revelation or anything, but it worked, and that's what this wine is good for. It's not so dry that you need some sort of red meat, but it's not super jammy or acidic either, so it worked fine with this meal. Beer Nerd Musings: I'm not aware of any beer specifically aged in Montepulciano barrels or anything like that, though the ubiquity of Sangiovese means that I've definitely had some beers that incorporate such grapes (or wines). Stillwater has made some Brunello barrel aged beer, and those wines are almost always comprised of 100% Sangiovese (though I gather that there was some sort of controversy a few years ago where producers were blending in small portions of other grapes to even out the wine). This particular blend seems like it could work well with beer, whether you go for the grapes or just use the barrel for some flavor. Every now and again, you'll run across a certain type of beer nerd who will suddenly proclaim that beer is, like, totally played out and they're just going to focus on cider from now on. Some of these people are just playing weird status games, others are genuinely fed up with certain less-than-desirable aspects of beer nerdery. Fair enough, but I don't think you'll see me blazing that particular path anytime soon. However, since I'm currently embroiled in my annual quasi-hiatus from beer, there's no reason not to dip my toes into the cider world. A friend of mind got me this bottle for Christmas and I must thank him for attempting to broaden my horizons. Plus, I've never had anything but mass-produced ciders from the big guys, so trying something at a lower level would probably do me good. Cider Nerd Details: 8.5% ABV bottled (22 ounce bomber). Drank out of a libbey cider glass on 2/12/16. Beer Nerd Musings: I'm guessing cider is more a study in subtlety than beer, with differences between styles being harder to pick up on than with beer, and so on. This seemed well made, but lacked the intensity of an 8.5% beer. Not that it has to have that sort of intensity to be worthwhile or anything, and I certainly don't care for the more intense (i.e. cloying) varieties of cider that I've had. I haven't had many ciders, but I have had a couple of cider/beer hybrids. Tired Hands did a couple a while back, one a hoppy blend, the other a Berliner blend, both were pretty darned good, but perhaps that was novelty speaking (and to be sure, they're sorta hard to categorize). Perennial has something called Jack Rose that's made with apple juice, but I haven't tried that yet. So there's my first cider review. I liked it well enough, but I wouldn't hold my breath waiting for more! 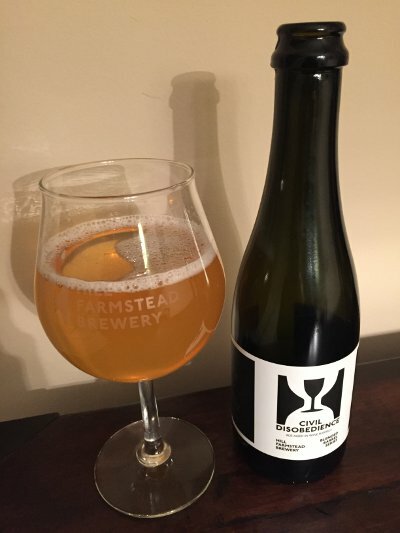 I have been very fortunate to have sampled deeply from the Hill Farmstead catalog, but the grand majority of my experience has been with their highly sought after IPAs and their saisons. 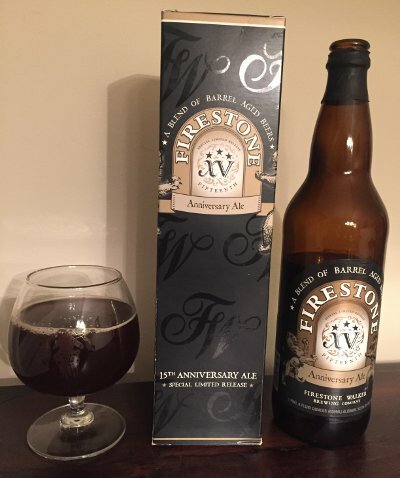 When it comes to barrel aging, I've not had much at all. A small bit of Flora at a tasting once, maybe one of their collaborations, but otherwise not so much. Thus, when I lucked into Civil Disobedience #14 during my last visit, I was quite excited. 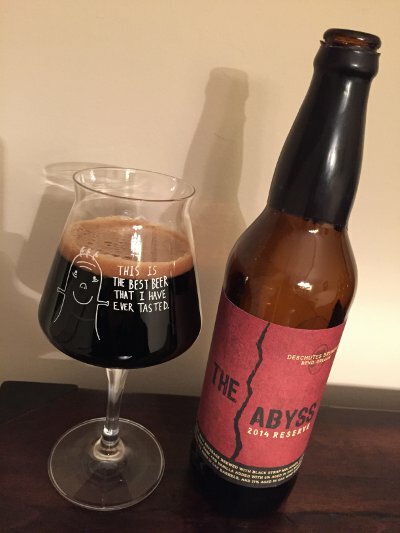 Per early reviews, the carbonation was still developing, and knowing the way I generally react to such a thing, I decided to sit on the bottle for a few months (and yes, the carbonation was indeed fine when I drank this). Beer Nerd Details: ? ABV (somewhere around 5.5-6%) bottled (375 ml). 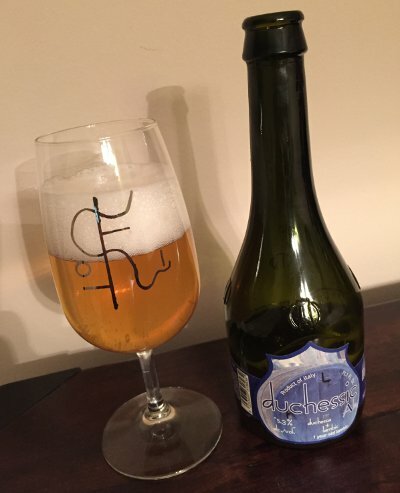 Drank out of a charente glass on 2/5/16. Bottled: 01 2015. Batch 14. I have to say, these Hill Farmstead saisons seem to age pretty well. 2014 Florence is drinking fabulously right now, and I'm betting bottles of 2015 Arthur are starting to peak too. Dorothy's hop character is fading (and I don't think I have any left), but it's still pretty good anyway. Counting the days until my next trip, which is vexingly vague right now (though definitely a trip in July, we may figure out an earlier jaunt). Given my heritage, it's surprising how little Italian beer I've sought out. I suppose most Italians reach for a glass of wine with their meals, but I've been hearing for years that the Italian beer scene has been exploding. Alas, I've not had a ton of great Italian beer. I've always chalked this up to availability. It's not like Italians are getting that sweet Tired Hands juice on the reg, so it stands to reason that I'm not seeing the best of their scene either. A friend who recently went to Italy mentioned that a lot of wineries sorta do brewing on the side, stuff that I assume doesn't get distributed far and wide. This obviously means I need to get off my arse, renew my passport, and tour some Italian winery/brewery hybrids. 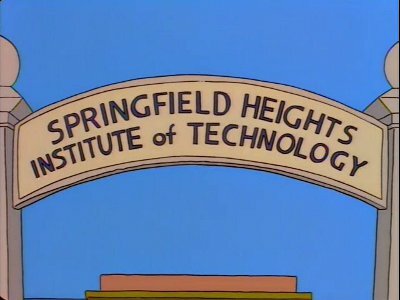 In the meantime, I'll have to make due with the stuff that does find its way over here. The Italian beer I have enjoyed usually has a distinctly Belgian bent to it, and this is no exception. Indeed, look closely and you'll see that this is a blend of Birra Del Borgo's standard Duchessa saison (not a particularly heralded beer) and 1 year old lambic. Upon even closer inspection, it turns out this is a collaboration with Cantillon. I mean, if you're going to blend 20% of lambic into your beer, I guess Cantillon would do the trick. Maybe. 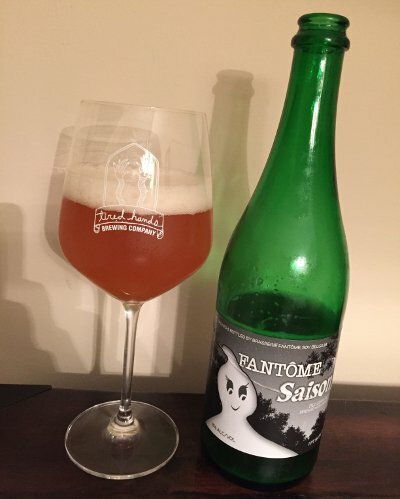 The releases of this are somewhat irregular and they apparently sometimes suffer from that ropey Brett viscosity (drinkers of Fantome know what I'm talking about) that they fix before it's released (there's a video explaining this... but it's not subtitled, so have fun with that.) Anywho, this marks the second time in the past month that I've drank a beer blended with a small amount of lambic. So far, these don't seem to have the complexity or elegance of their fully lambic counterparts, but the blending does add some nice notes for sure. How does this one fare? 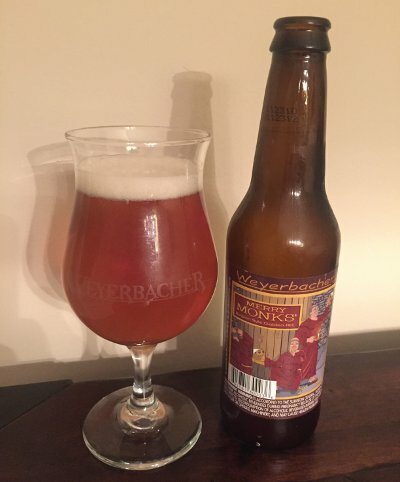 Beer Nerd Details: 5.9% ABV bottled (11.1 ounce). Drank out of a flute on 2/6/15.